Qualitative Behaviour Assessment (QBA) is a method for animal welfare assessment that judges the dynamic expressive quality (‘body language’) of animal behaviour (e.g. relaxed/curious, tense/restless). Research at SRUC developed and validated this methodology, and in collaboration with research groups across the world is now focusing on practical application to improve the quality of life for captive animals. The UK Farm Animal Welfare Council states that standards for animal welfare must ensure that animals have a ‘life worth living’, but should also aspire to give them a ‘good life’. Judging an animal’s body language allows experienced observers to make subtle, holistic judgements of the animal’s state, gaining information not easily obtained through quantitative physical measurement. However, such judgements are also controversial and plagued by fears of anthropomorphic projection. QBA research aims to develop scientifically tested scoring protocols for a range of captive animal species, and implement these through training and education. Research at SRUC and other institutions has shown that people generally agree in their qualitative judgments of animal body language, even when they have different attitudes and backgrounds (e.g. 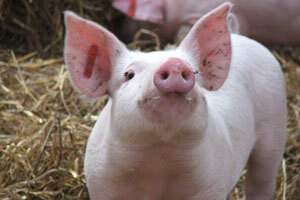 pig farmers, veterinarians, animal protectionists, consumers). Our research has also demonstrated that such judgments can correlate well with other measures of animal welfare, and play an important role in interpreting such measures, because it sharpens our understanding of an animal’s emotional state. Given such positive results, QBA has been accepted as a welfare indicator for pigs, cattle and poultry in the EU-supported Welfare Quality® protocol. Current research at SRUC is focusing on developing QBA protocols for sheep, goats and donkeys, and on applying QBA to the early detection of pain and the enhancement of positive well-being. We are investigating how QBA assessments vary over time, and how they combine with other practical health and welfare measures. Together with other research partners we are working on automated data recording and analysis methods, educational video materials, and online training procedures, to encourage appropriate uptake of QBA. Of course, judging animal body language is not a novel idea. Knowing whether animals are relaxed and content, or tense and anxious, is an ability acquired by most people working and living with animals. Yet people also have different degrees of empathy with animals, and can project their own interests on to animals, while not making enough effort to observe the animals’ expressions. For example, farmers whose animals are healthy, and reasonably calm and responsive, may not notice the chronically listless, irritable quality of the animals’ demeanour, indicating a lack of positive well-being. Such subtle but important aspects of behavioural expression would become evident only in comparison with other animals kept in different systems, or managed by different people. However, farmers, zoo-keepers, or laboratory animal caretakers do not necessarily have the opportunity for such comparisons. Thus QBA has the potential to play an important role as a tool for education and training, building on people’s existing skills to achieve better awareness and judgment of animals’ well-being. It became clear from consulting farmers in different Scottish regions that they would welcome such tools, but only if organised collaboratively, with farmers as the drivers of change. Other non-farming organisations have also shown interest in such participative implementation of QBA, and together with various institutions and organisations we are now working towards this goal. QBA research has been co-funded by Defra and The Scottish Government, and benefits from many formal and informal collaborations. Contact Dr Francoise Wemelsfelder via the details below.